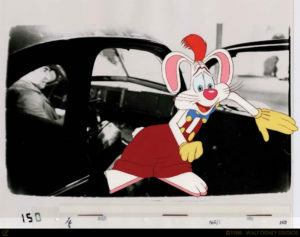 Richard Williams won two oscars for Who Framed Roger Rabbit (1988, directed by Robert Zemeckis), one for the animation direction and the other for special effects. This was a ground breaking film. 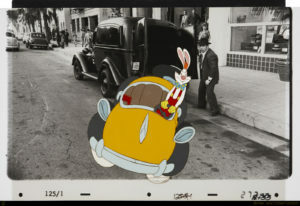 Cartoon animation was combined with live action to create a story about a cartoon rabbit who is framed for a crime he did not commit. Set in the 1940’s the Toon characters live along side humans, they are the underdogs of Hollywood, consigned to ‘ToonTown’ and working as low wage performers. 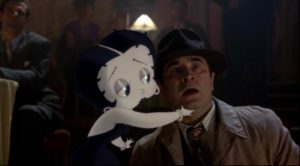 Expertly combining film noir with slapstick comedy, the film succeeds in drawing the audience in to care about the Toons who become real, living characters amidst real world actors. We are drawn into believe in a completely make believe world, with no reservations, and tackle the serious themes of racial discrimination at the same time. Bringing together Richard Williams Studio, Disney, Warner Brothers, Steven Spielberg’s Amblin Entertainment and George Lucas’s Industrial Light and Magic, it was the first time that this technique worked really well. 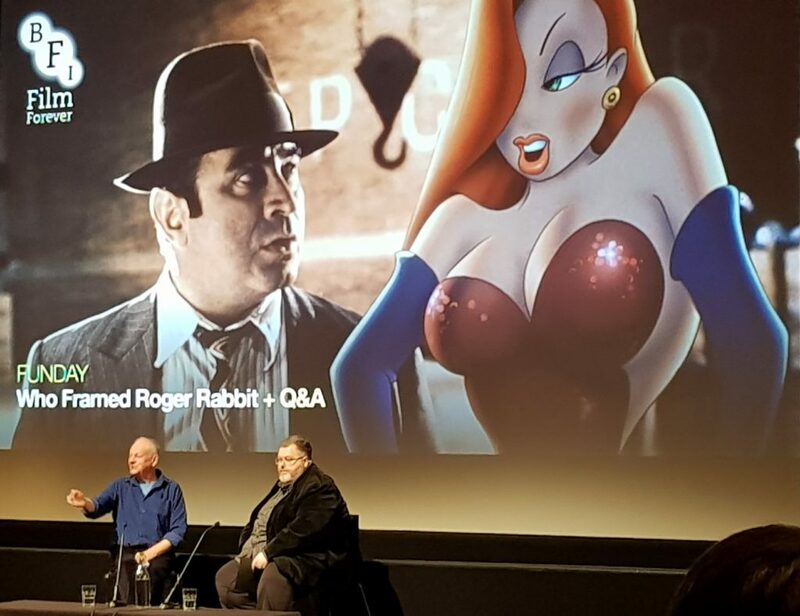 In December 2018, The BFI screened Who Framed Roger Rabbit with a Q&A with the Animation director after. This is a writeup of the talk he gave and the questions after. Initially he was reluctant to work on this film, because of the potential flatness of it. The technique had been done before in Mary Poppins but was not very convincing. He didn’t like Mary Poppins, and didn’t want to make something that he felt was flat. The two mediums can cancel each other out, the animation can appear to simply sit on the live action frame as a flat sequence on top of it. Flat drawings pasted onto live action didn’t work for him. He only wanted to do the movie if he could overcome this problem. The director (Bob Zemeckis) also wanted to make a modern movie and be free to move the camera. The camera needed to move to bring both mediums together, to make it convincing, the animated characters have to appear to be in that same space as the live action characters, so by moving the camera the animated characters are seen in a three dimensional way, just as the live action characters are. Many studios wouldn’t do the project because they didn’t want to move the camera, it was seen as too complicated to do. However Richard had just done this on a Walt Disney commercial where he broke all the rules and discovered that new things were possible with a bit more effort, so he was very happy to do this film. They needed the improvements of optical printing to combine the two mediums, so that the two forms could be printed into the same frame, rather than the animation appearing to sit on top of the live-action. 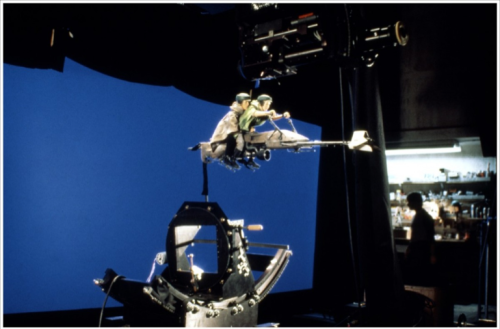 Star Wars: Return of the Jedi had just used this technique already for the Speeder Bike sequences (Ken Walston at ILM), so they could develop and build on this technology. They wanted the characters to be 2D, as they are period characters and needed to look like that, so he suggested 2.5 dimensions, which is a 2D looking character that you can still track the camera around as if it was 3D. He insisted on doing the work in the UK, not moving it to Hollywood, which they initially wanted him to do. So Disney seconded the studio, took it over so that it was restructured just to do that film, and grew to 320 people working on that film. It started with just 40. It was a Hollywood blockbuster film, but the animation was all done in London, an extraordinary combination of very high calibre artists, a very professional production where everyone was at the top of their game. Everyone knew it would work. Combining animation with live action also means that the animation had to be done on one’s because the two motions jar if you set 2’s with one’s. This double the normal workload. Moving camera means that all animation has to be done on one’s, even for pauses and slow movements. Each frame of camera movement were printed out as a reference so that the animated character could be positioned correctly in the space as that space moved frame by frame. All the animation had to be done after the live action was shot. As they needed the reference of the live action to animate too. The characters not only had to respond to the moving space, the moving light in the space but also the live actors too. The live action environment needs to affect the animation. The lights from cars need to show on the animation. Sometimes they had to shoot and actor in that space to see how the light will fall on the character. They realised that the key to believability was to make the actors and animated characters physically interact with each other as much as possible. After a test shot that would combine all the most complex aspects of the film, they realised that it would work and look great, and what the workflow would have to be. In fact it was this test shot, that was shown to a test audience of kids, that was the deciding factor for whether the producers went ahead to fund the movie. Although he was invited to the film shoot, he said after a while, you don’t need me, just shoot the movie the way you want to and we’ll animate to the shots we get. Bob and Roger would sit at the Steinbeck looking through the rushes, Bob would say where he wanted the Rabbit and Roger would sketch it out for him, so they both knew what was needed. 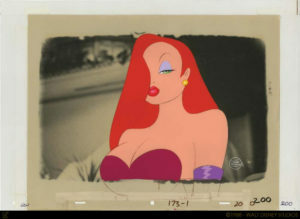 Tex Avery humour, but not so brutal. It was a Frankenstien combining Droopy’s peanut shaped head, Goofy’s trousers, Briar rabbits feet, Mickey Mouses yellow gloves, Oswald the Rabbit ears, Porky Pigs bowtie. The only original thing was probably the one tooth to the side. All the other characters had to be hired from the other studios. Through the film, more characters were added as the studios who owned them realised that the film was going to be a hit and wanted to be a part of it. Virtually every major carton character from the late 1940’s was in the film, with the exception of Felix the Cat and Popeye the Sailor whose licensees couldn’t agree on terms with the films producers. They had to be respectful to the characters they used and get them just right. Also the characters had to be in the correct era. 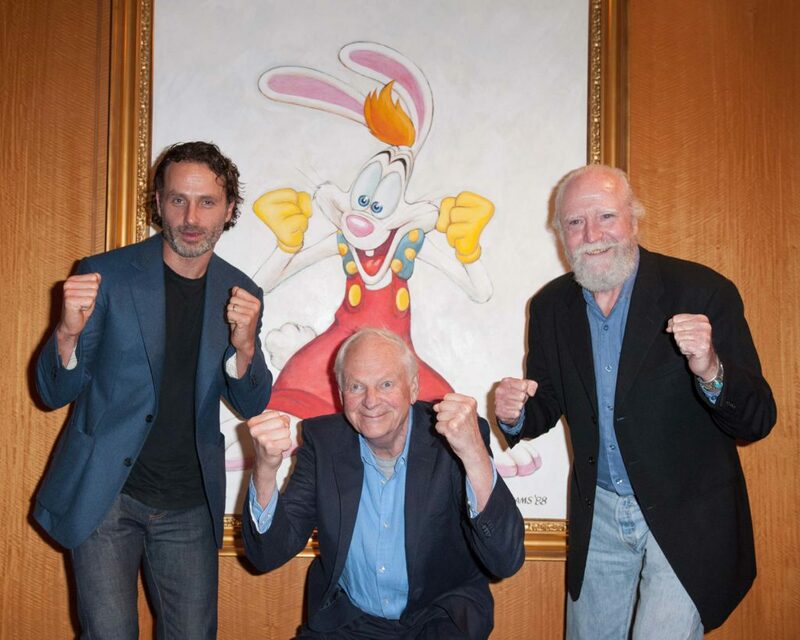 So they are 1940’s characters, and bugs bunny in the 1940’s is different than Bugs Bunny at a later date. He also added some Max Fliesher inspired characters, in the background which he called ugly characters. There was talk of a second film after the successful release, but he was done with the Rabbit by then, and would not have done a second movie. He got out alive with two Oscars. For a limited period Warner Brothers were distributing Disney films in Europe. There was a temporary marriage between Disney, Warner and Spielberg (Zimmekis was with Spielberg), which felt wouldn’t last for ever. A short they made called ‘Roller Coaster Rabbit’ (Roger son Alex animated on this film) resulted in a fight over ownership, and the trinity unravelled. 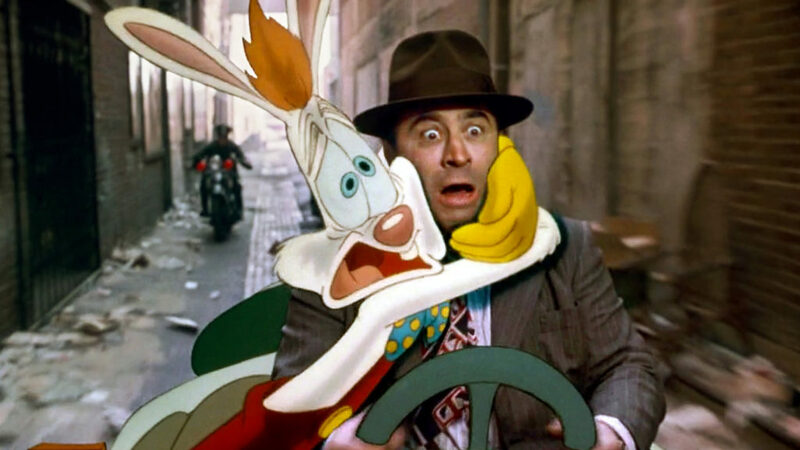 So a sequel to Who Framed Roger Rabbit could not happen. When he was 5 he saw Snow White. 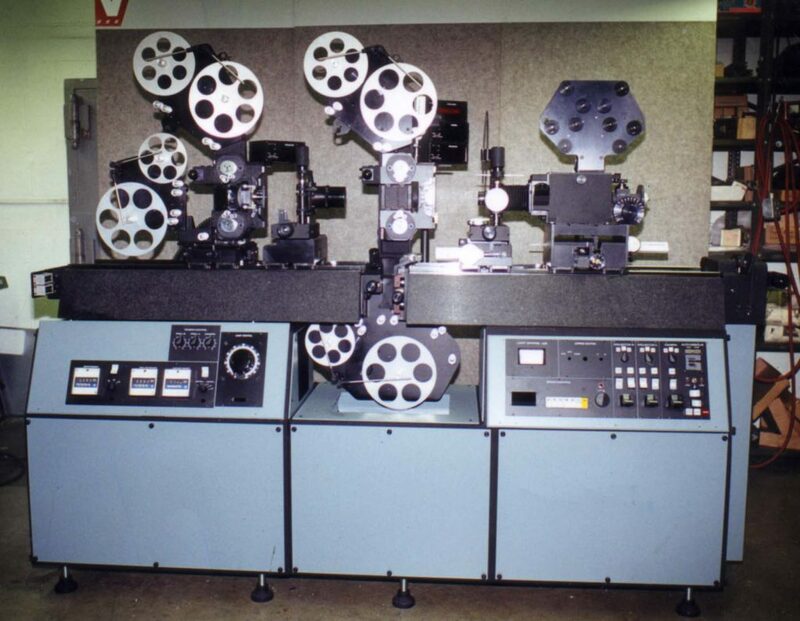 After that he found a cartoon cinema, where he went for years, to just watch cartoons. His favourite character is droopy and he actually did the voice for it at one time. Q: How did you get the interaction between the humans and animated characters? His wife figured it out. 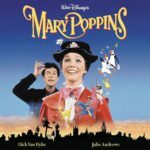 In Mary Poppins, there is a moment where the fox is inside someone’s coat, the animated character is moving the live action coat, and for the first time that film seemed to work. So they realised that the key was Interaction. He decided that the animated characters had to interact with the live action ones as much as possible. So the film was shot with this in mind. Springs were put inside jackets, wires were attached to make elements of the live action move, so that the animated characters could be entangled with the live action as much as possible. 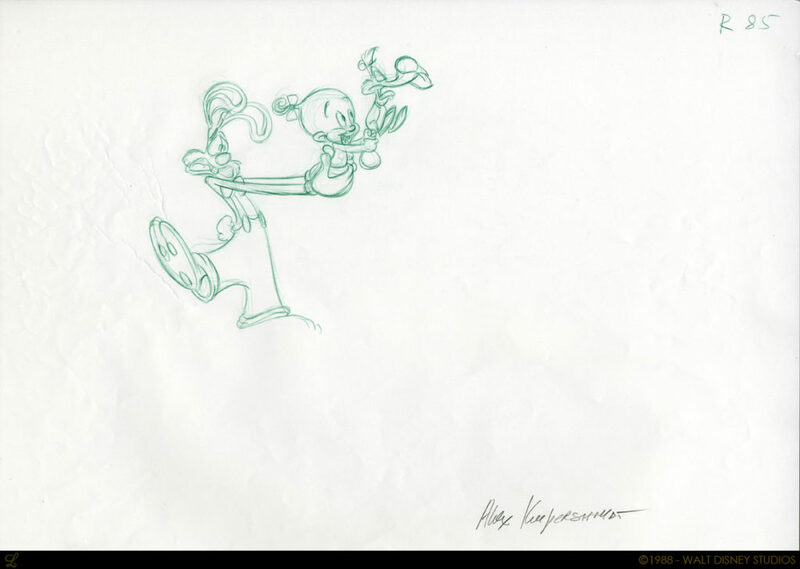 Q: Does drawn animation still have a place today? He was Oscar nominated a few years ago for a beautiful pencil drawn animated film (Prologue, 2015). He says he is still getting better as an animator. For large productions it’s all about money. If it can make money they will do it. It’s down to what the audience want to watch. It’s actually cheaper than some CGI, it’s a myth that drawn animation is more expensive. Q: What’s your advice to aspiring animators? Learn both, digital and drawn. The basis of animation is the same for both anyway, it’s just the mechanism of how to deliver it. The knowledge of movement and the performance is exactly the same, it’s just that the computer stuff is high, high tech marionettes. You make a model and then have to move it with a mouse instead of a hand, but you still need to know how to move it. 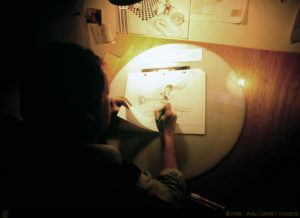 You can be a terrific animator these days without having to know how to draw. Q: How did the actors deal it, did they have anything to act against? No they had to act against nothing. So they had their own marks to act to. 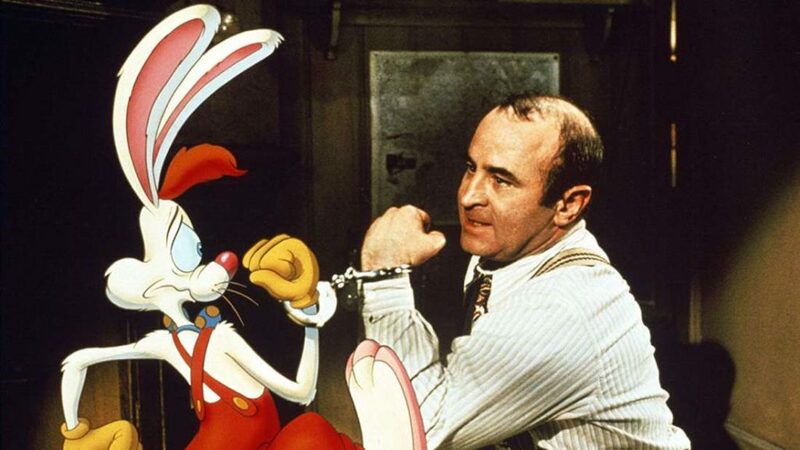 For example the Rabbit’s eyes are about the height of a belt buckle, so Bob Hoskins had to look at the air just in front of the height of a belt buckle. He has incredible concentration so he did it well. 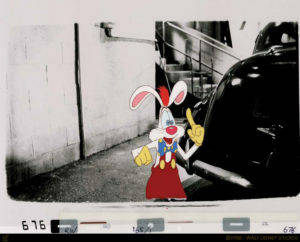 One shot had a mistake, and the actors eye’s were looking up at the rabbit, so they simply animated the rabbit elongating for no reason, apart from him being neurotic, so that the actor had to look up at him. It worked, they even used it on the trailer. 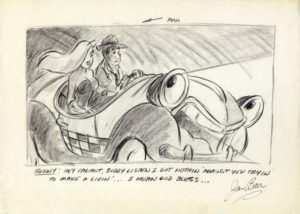 Throughout the film the animators simply drew the characters into where they needed to be for the actors eyes, and the interactions with the actors, so that it worked. 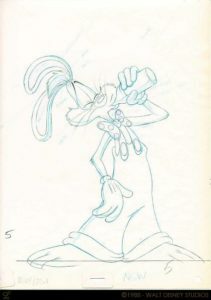 The voice over artist for the Rabbit, wore a rabbit costume to help him get into character when he did the voice over for the film. 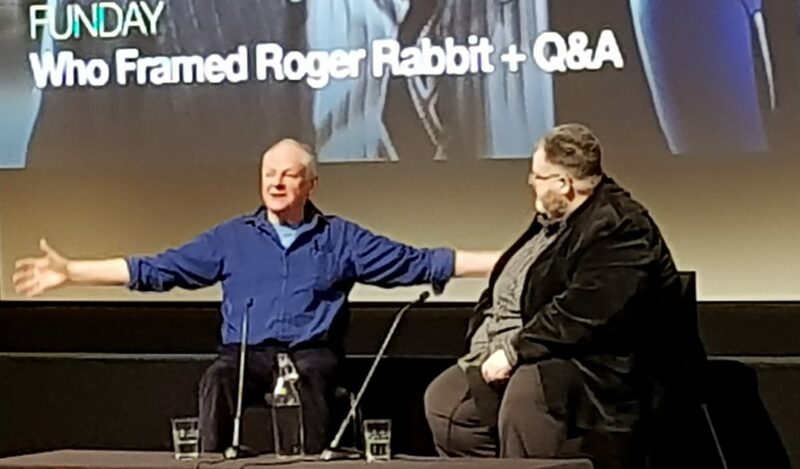 Here is a video of an interview with Richard Williams about Who Framed Roger Rabbit, at the BFI back in 2014. 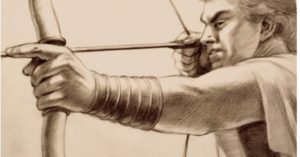 Images from Character Design References blog. I considered people like this to be a genius, imagine this great work that has came out of his hand ,I’ve been seeing posts on animation these days and I’ve been falling in love with it.To embark on animation project do I really need to undergo a professional training.I will be looking forward to your reply. Thanks Lok, yes you have kindly commented on many of my posts! Like you suggested in another comment, you don’t have to be a genius to make animation, or even to make a good film. But you do need skills. Professional training can be a great thing to have, but, it depends where you get that training, and exactly what that training is for. Some providers are very good and others are less so. There are also some training providers that will train people for industry jobs and others that train you to make independent films. So again it does depend on what you want to be able to do. Whether you do training or not, you will need to practice, a lot, to develop your skills. You will also need to learn some software. Sometimes it is a good idea to do some kind of animation first before deciding on whether to continue on to do professional training. It will also help you to decide whether you want to pursue it as a career, or as an artist, or as someone who wants to make some films, alongside another career. All are completely valid and necessary. If you want to give it a go I have some posts under the category of Beginners Guide to Stop Motion which is the easiest place to start. Or simply start with my 3 easy steps here. I have also reviewed some free software that you could try. This website is aimed at people who want to make animation, either for the first time or to develop their skills, appreciation, understanding and knowledge. However there is one thing that I absolutely would advise you do, whether you do professional training or not, and that is to buy this – Richard William’s The Animators Survival Guide its a must have, especially as you like his work on Who Framed Roger Rabbit! He also has and DVD training set which I will give you a link for soon! Thanks again for your comment, and good luck with whatever you decide to do. Man. Making my own series was always one of my dreams since I was a kid. But as I grew older, I realized the amount of money, detail and skill that had to be input into the project just to make a few scenes. I mean, that just bolstered my respect to those who make great things in the industry. Especially with people making great independent animations now. 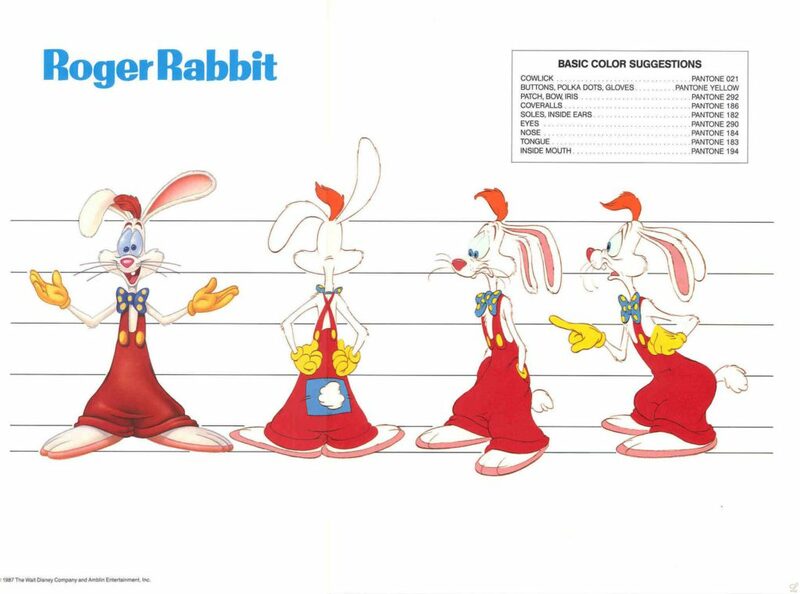 Roger Rabbit was astounding but something I love is that you don’t need to be astounding to make it in the industry in most areas. But if you manage to BE astounding, you’ll be remembered for years and years to come. People still talk about old Disney films, and in the realm of anime, Cowboy Bebop is still many people’s favourite despite a flurry of new ones being produced every year. If I ever live to work in the industry and see my own stories on a big screen, I don’t think there’s much in this world that could top the happiness I’d feel then. Thanks Caldero, I hope you do live to see your stories on the big screen! Happiness is the process of working towards that dream. You are right, the astounding people will be remembered forever, but you can still make a great short film, send it to festivals and see it on the big screen there. If you keep making great films, you may become astounding too, it all starts with one film, then another, then another, aways improving, always learning. I hope this website will one day help and encourage people to do just that. Thank you for your time and for leaving a comment.